Last October I had the opportunity to fly out to Vancouver and attend Knit City, a weekend knitting conference and marketplace. I wasn't teaching or selling, so this trip was purely to attend the event for myself and finally meet designers, yarn dyers and shop owners that I had been admiring from afar. Plus, this was a perfect excuse to visit Vancouver for the first time. I had only been to the West Coast once before and that was to attend Vogue Knitting Live in Seattle, nearly five years ago. VKL was my first knitting conference experience. It was overwhelming and very energizing at the same time. 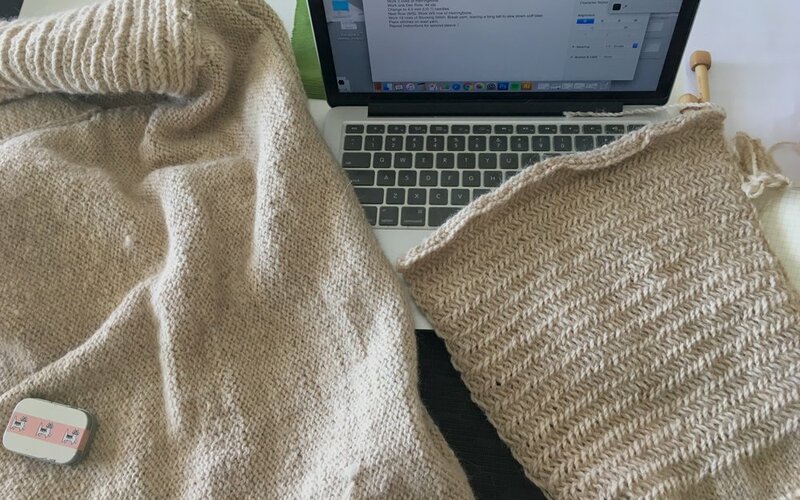 After a weekend of classes and talking to other very supportive knitters, it was here, where I decided to make a real commitment to publish my own designs. A few months later, my first design, Take Heart, with published in Pom Pom Quarterly. My trip to Vancouver reminded me of that first experience in Seattle, fully immersed in the knitting community of a new city. I've had the chance to work at many other knitting festivals, such as Unravel and Edinburg Yarn Festival in the UK and Knit East in New Brunswick, but when I'm not working these types of event, I feel very much like a kid in a candy shop. Being surrounded by gorgeous fibre and knowledgeable knitters gives me the opportunity to discover new yarns and gather inspiration and energy for new projects. Part of my Knit City haul. Over the weekend at Knit City, I found myself coming back to one booth in particular. Skeins of a delicious alpaca and wool blend were spread across the table. This is where I met Hanahlie, the hands and heart behind Hinterland, a Canadian based yarn company. I immediately fell in love with their yarn, Range, an aran weight blend of alpaca and Rambouillet which is grown and spun in British Columbia. I also met designer, Lindsey Inouye, also known as Standard Knits. She was helping Hanahlie with her booth that weekend and also promoting some of her own designs knit with Hinterland yarn. I brought her pattern Bowen and enough of Range in Cloud to make it. Pictured above is a portion of my haul from that weekend - books by Vancouver designers Caitlin ffrench and Sylvia McFadden, a Bowen pattern and skeins of Cloud. Once I was home from Vancouver, I quickly knit up a Bowen sweater for myself with the Hinterland yarn I had brought back. Within two weeks I had it finished, just in time to fly off to Rhinebeck, a wool and sheep festival in upstate New York. In fact, I don't think the sweater was fully dry when I boarded the plane. Oh well. Even though I lived in my Bowen sweater all winter, the yarn still manages to look fairly new but has that cozy feeling of being well worn. I had exchanged a copy of my book, Take Heart, with Hanahlie for some skeins of Range while I was at Knit City. 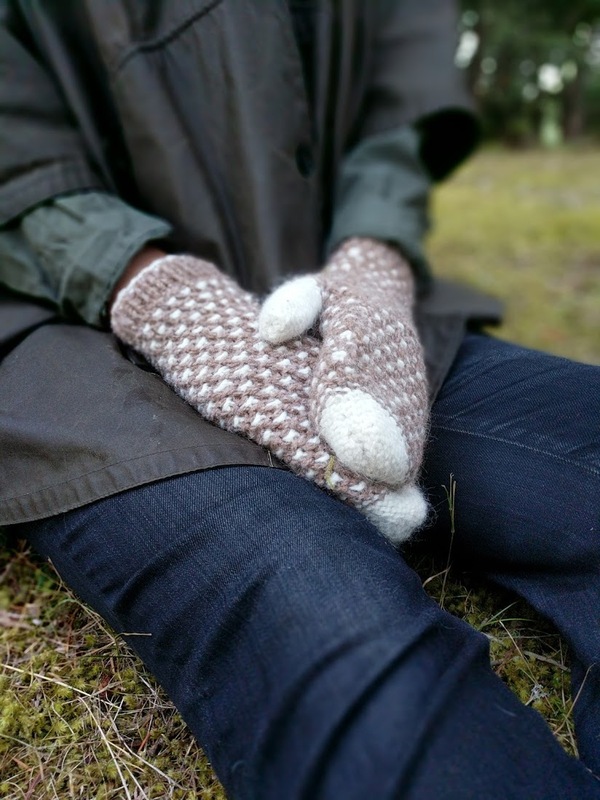 This winter, Hanahlie had contacted me to say she was knitting my Chester Basin mittens from the book and asked if I would be interested in designing with Hinterland yarn. I naturally jumped at the chance and thus began our collaboration between East Coast and West Coast. Bedwell, my hat and mitten set were the first pieces to be designed. I wanted to find another fun but simple-to-knit texture like the Chester Basin set. 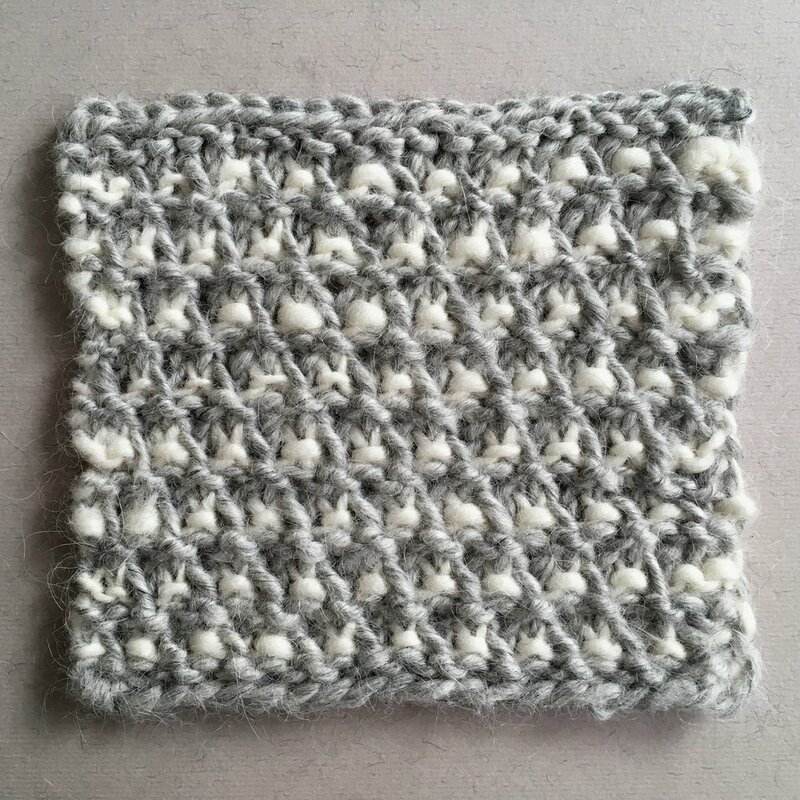 Hanahlie sent out a skein of Maple and Snow in her aran weight yarn, Range. The hat and mittens are a combination of knits, purls and twisted slipped-stitches. It creates a great bumpy texture on the outside with an overall dense and cozy feeling, perfect for winter accessories. Bedwell can be completed with just two skeins of Range with plenty of yarn leftover to add a pompom if desired. Next we started discussing sweaters. These two projects were a combination of what Hanahlie and I both like in a sweater, something slightly over sized and with pockets. Hanahlie also mentioned that she really liked Herringbone Stitch, so I incorporated that texture into one sweater. For the other one, I added a small section of Intarsia onto the sleeves since I had been playing with that colour work technique recently. This time, Hanahlie sent out a mountain of yarn and I got started on my third and fourth sweater designs. The first was Kinsac, a cozy v-neck sweater, worked in pieces from the bottom up with dropped shoulders. I used Ash for the main colour and Snow for the contrasting sleeves. The colour work detail on the sleeves was worked using Intarsia to create a tidy and smooth surface on the inside. There are small pockets on the front but those could be easily ignored if you prefer a sweater without. My cat, Fergus and I are both huge fans of alpaca blends. It must be because of the soft finished pieces it creates. Every time I turned around I'd find him using my alpaca shawls and sweaters as a pillow if I left them around. Here he is, caught in the act, when I had the sweater out to dry. I inadvertently had created a perfect Fergus-sized, alpaca lined hammock, so I can't blame him for choosing to nap there. Thankfully, they are both grey. My final sweater for this collection was Pinehaven, a boat-neck pullover in the colour Honey, with pockets and Herringbone sleeves. I believe this was my most challenging sweater to date. It took me several attempts to finally get my inset pockets to work and be nearly invisible from the outside. This sweater has traveled with many kilometres with me, just like Barbicel. I brought it to work on while I was in Helsinki this summer, then to Portugal for a few weeks when I was on my way back home. Finishing touches, such as sewing in ends and blocking, were done here in Nova Scotia, before being sent back out West to where the yarn had originated. That was over 28,000 kilometres of traveling with this yarn in my project bag. It's now time to introduce you to the final shots of Bedwell, Kinsac and Pinehaven. I love Hanahlie's idea of naming the collection, Seafarer since it can incorporate both of our lives being close to the Atlantic and Pacific Oceans. The names Kinsac and Pinehaven were chosen from names of areas I grew up around in Beaver Bank, Nova Scotia. 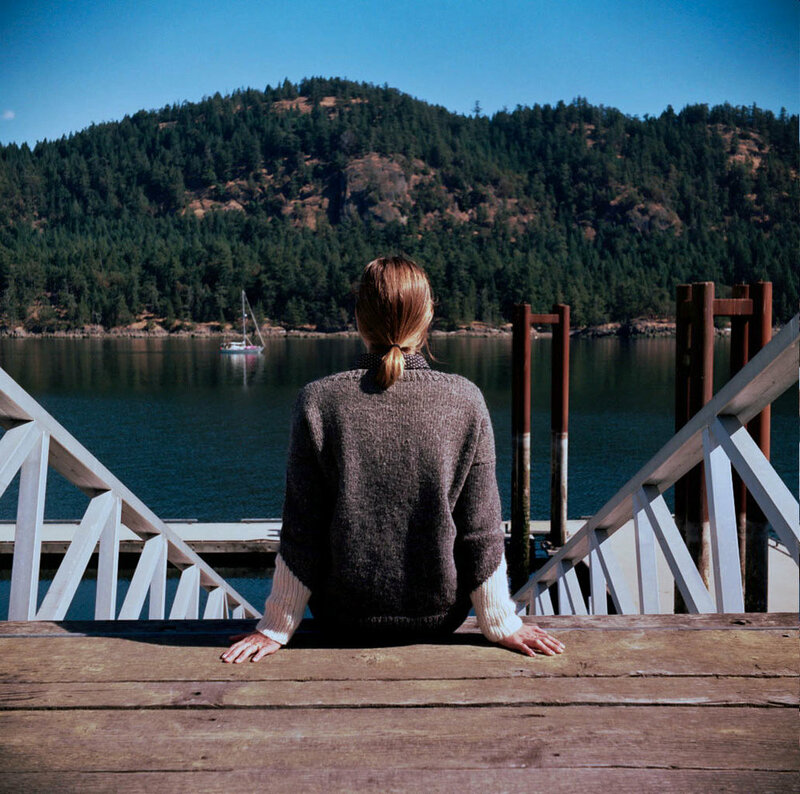 Bedwell is the name of the waterway in the background where some of these photos were taken on Pender Island, BC. Thank you to Hanahlie for collaborating and for all the incredible yarn. 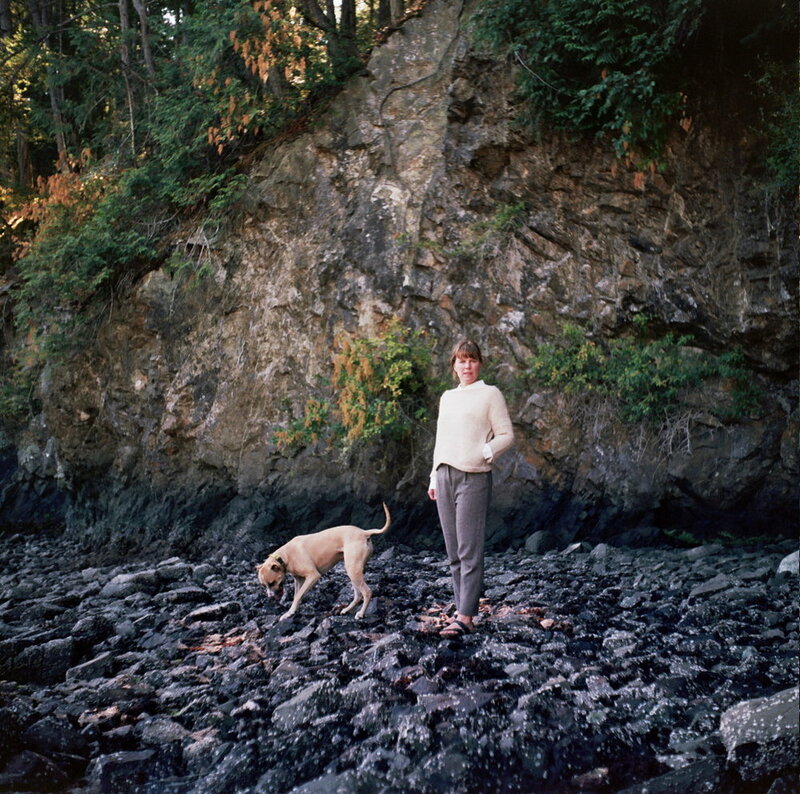 Also thank you to Celeb Bayers for the beautiful shots on Pender Island and to my patient tech-editor Jemima Bicknell. If you're in the Vancouver area, you'll be able to find Hinterland at this year's Knit City, Sept 30 & Oct 1. Stop by to say hi to Hanahlie and see the designs in person. These patterns will be available through Ravelry. Bedwell Mittens, photography by Celeb Bayers. Bedwell Set, photography by Celeb Bayers. Kinsac, photography by Celeb Bayers. Pinehaven, photography by Celeb Bayers.